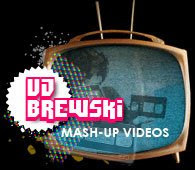 Welcome to VJ Brewski's mashup video page! This is where I'll be sharing my collection of video mashups that I've made for various DJ artists and bootleggers from around the world. If you'd like more information on my videomixes, please feel free to email me at vjbrewski@gmail.com. Thanks! Bootie comes to Sydney and Melbourne! "Down Unda Club" Men at Work vs. 50 Cent - In da Club. Another DJ Lobsterdust, VJ Brewski collab! The majority of the music here has been, by my own free admission, created using non-sanctioned, copyrighted material of other artists. All audio and video material of this nature is for demonstrating purposes only and, unless you own the copyright, should not be kept or redistributed. I do not make any money from this and I believe the end-product is sufficiently different not to cause the original artists any financial hardship. However, I will remove any file upon receipt of a written request to do so. Finally, if you like the music you hear on this site, please go out and buy something by the original artists - one hand washes the other.